Rigi, S., Sakhaei, A., Niknam Asl, A., Alizadeh, A., Beigi, F., Mehdizadeh, M., Ketabi, M., Soleimani, M. (2014). Neuroprotective Effect of Coenzyme Q10 in Hippocampal Injury in Balb/c Mouse. Journal of Applied Biotechnology Reports, 1(2), 55-58. Sara Rigi; Abolhassan Sakhaei; Azadeh Niknam Asl; Akram Alizadeh; Fatemeh Beigi; Mehdy Mehdizadeh; Majid Ketabi; Mansooreh Soleimani. "Neuroprotective Effect of Coenzyme Q10 in Hippocampal Injury in Balb/c Mouse". 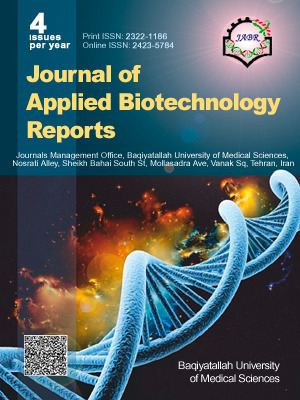 Journal of Applied Biotechnology Reports, 1, 2, 2014, 55-58. Rigi, S., Sakhaei, A., Niknam Asl, A., Alizadeh, A., Beigi, F., Mehdizadeh, M., Ketabi, M., Soleimani, M. (2014). 'Neuroprotective Effect of Coenzyme Q10 in Hippocampal Injury in Balb/c Mouse', Journal of Applied Biotechnology Reports, 1(2), pp. 55-58. Rigi, S., Sakhaei, A., Niknam Asl, A., Alizadeh, A., Beigi, F., Mehdizadeh, M., Ketabi, M., Soleimani, M. Neuroprotective Effect of Coenzyme Q10 in Hippocampal Injury in Balb/c Mouse. Journal of Applied Biotechnology Reports, 2014; 1(2): 55-58. Bhagavan, H.N., Chopra R.K., Coenzyme Q10: Absorption, tissue uptake. Drug Metab Pharmacokinet J, 2006, Vol. 40(5), pp. 445–453. Beal, M.F., Mitochondrial Dysfunction and Oxidative Damage in Alzheimer’s and Parkinson’s Diseases and Coenzyme Q10 as a Potential Treatment. Bioenerg Biomembr J, 2004, Vol. 36, pp. 381-386. Lee, B., Lin, Y., Huang, Y., Ko, Y.W., Hsia, S., Lin, P.T., The Relationship between Coenzyme Q10, Oxidative Stress, and Antioxidant Enzymes Activities and Coronary Artery Disease. Sci World J, 2012, Vol. 2012, pp. 1-8. Kagan, V.E., Quinn, P.J., Coenzyme, Q., Molecular Mechanisms in Health and Disease. Modern Nutrition Series. 1 edit, CRC Press, 2000. Yang, X., Dai, G., Li, G., et al., Coenzyme Q10 Reduces β-Amyloid Plaque in an APP/PS1 Transgenic Mouse Model of Alzheimer’s Disease. Mol Neurosci J, 2010, Vol. 41, pp. 110–113. Berkovic, S.F., Mulley, J.C., Scheffer, I.E., Petrou, S., Human epilepsies: Interaction of genetic and environmental factors. Trends Neurosci, 2006, Vol. 29(7), pp. 391-397. Tsenga, K., Chambersb, R., Lipskac, B., The neonatal ventral hippocampal lesion as a heuristic neurodevelopmental model of schizophrenia. Behav Brain Res J, 2009, Vol. 204, pp. 295–305. Person, P., Robert, N., Trimethyltin-Induced Neurogenesis in the Murine Hippocampus. Neurotox Res J, 2004, Vol. 5(8), pp. 623–627. Jung, E., Lee, M., Ahn, Ch., The Neuroprotective Effect of Gugijihwang-Tang on Trimethyltin-Induced Memory Dysfunction in the Rat. Evid Based Complementary Altern J, 2013, Vol. 4, pp. 1-6. Kalayci1, M., Unal, M., Gul, S., Effect of Coenzyme Q10 on ischemia and neuronal damage in an experimental traumatic brain-injury model in rats. BMC Neurosci, 2011, Vol. 12, pp. 1-7.